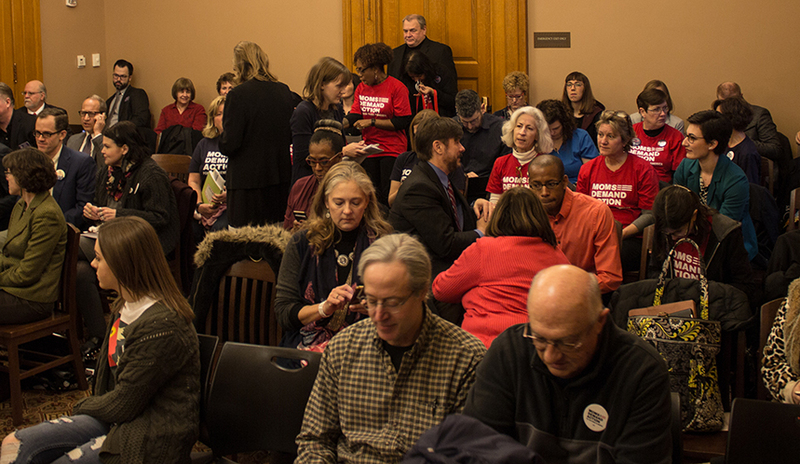 On February 13 at 10:30 am in Topeka, the Kansas Senate will hear testimony on House Bill 2042, which appears to offer sensible gun regulation but in fact does nothing of the kind. (Try to contain your surprise.) I cannot be there myself. So, I have submitted my testimony in advance. I am also posting both text and video of my testimony here. If you can be at the capitol, please go. If not, please contact your representative. Thank you! My name is Philip Nel. I am a Professor at Kansas State University, but I offer this testimony as a citizen only — not as an employee. I would be pleased by the fact that HB 2042 mandates that 18-to-20-year olds get a permit and that anyone on a university campus get a permit to carry a weapon. I would be pleased, but the bill also includes Concealed Carry Reciprocity (CCR) — that NRA-promoted legislation says that all states must admit firearms from any state, irrespective of how unregulated that state’s guns are. So, if you’re from one of the twelve states that allows concealed-carry without a permit, then you can also carry in Kansas without a permit. In other words, CCR effectively supersedes HB-2042’s permit requirement. 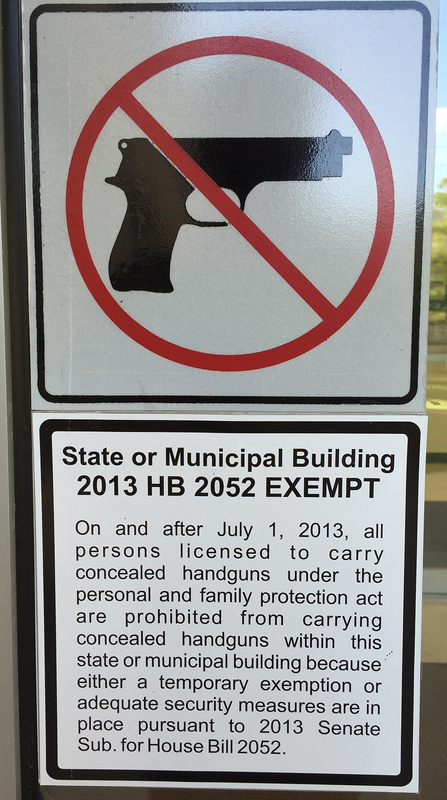 In effect, HB 2042 makes matters worse by allowing people under 21 to concealed-carry, too. It invites yet more guns into the state and into our workplaces. Thanks to the state’s Guns Everywhere Law, guns have already been forced into college dormitories, libraries, laboratories, classrooms, and offices. The actual name of that law is of course “The Personal and Family Protection Act,” so-called because the law does nothing of the kind and because those who named it are liars. Similarly, those who claim that Concealed Carry Reciprocity will make Kansans safer are also not telling you the truth. Which, at this point, surprises no one. The university where I teach does not need more guns. It needs more funds. Now, I realize that guns and funds rhyme. So, just to be clear: Guns are weapons that can kill people. Funds can employ faculty and staff who educate people. To be extra clear, I’ll use these words in a sentence. The arrival of guns on campus caused a former colleague to leave Kansas State University for a job at another university in another country. Funds could help hire a new faculty member to teach the courses that he is no longer here to teach. So, I ask the Kansas legislature to oppose HB-2042. Instead of endangering the lives of your constituents, do something that helps them. Pass sensible gun regulations, and provide adequate funding for education at all levels. Instead of arming citizens with bullets, arm us with reason — via a good education. books — the eleventh, Was the Cat in the Hat Black?, was published by Oxford UP last year. Drop me a line. (Email address is at right, under “A note on mp3s.”) I’d love to hear from you! “Just a Shot Away,” Inside Higher Ed., 12 Apr. 2016. A Weaponized Campus Can Be Fun!, 14 June 2017. “Firearms and Fascists: Does the Kansas House Believe in Democracy?” 8 Mar. 2017. I think we know the answer to this now. “Killing Higher Education, Literally: Kansas’ Campus Carry,” 1 Feb. 2017. Testimony. I was not able to deliver this in person. “Testify! Keeping Kansas Universities Gun-Free,” 26 Jan. 2017. My statement, delivered in person to the Kansas Senate Federal and State Affairs Committee at the state house. “Guest Editorial: Putting guns on campus is unsafe, disruptive to learning.” K-State Collegian, 21 Sept. 2016. “Armed and Unsafe: Why Kansas Universities Must Reject and Not Adapt to Weaponized Campuses,” 4 Sept. 2016. My statement to the university’s Weapons Advisory Work Group. “Guns vs. Schools,” 2 Dec. 2015. Includes a link to the Kansas State University Distinguished Professors’ statement. “When Will I Be Shot Dead?” 1 Oct. 2015. A Weaponized Campus Can Be Fun! 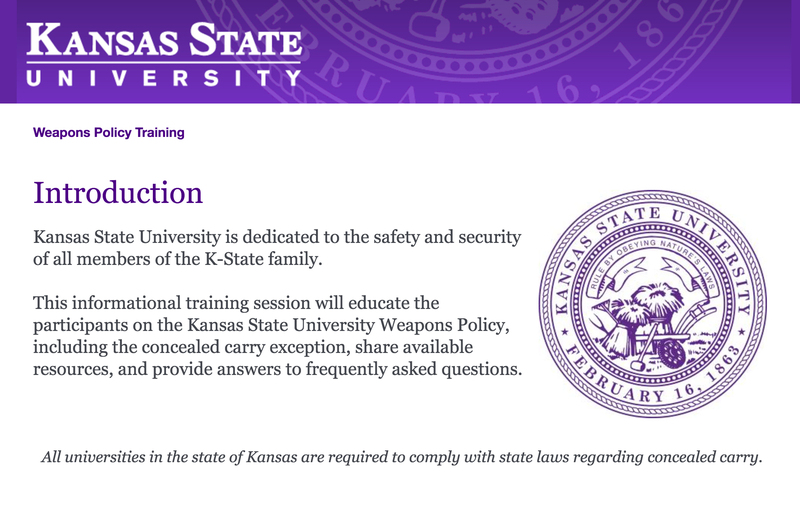 Excited about unregulated firearms coming to Kansas State University’s campus? Well, be sure to thank Representative John Barker and Senator Jacob LaTurner. They refused to let the university campus-carry exemption bills even come up for a vote in the full House and Senate. So, thanks to them, the citizens who voted for them, and to all the NRA lackeys who create the laws in Kansas, as of July 1st, Kansas State University will be fully weaponized! On July 1, the university’s exemption from the concealed carry requirements of the Personal and Family Protection Act expires, meaning that the concealed carry of handguns will be allowed in university buildings at Kansas State University and other state universities. K-State continues its commitment to the safety of students, faculty and staff and all members of the K-State community. The dark irony created by the juxtaposition of these two sentences is genius. 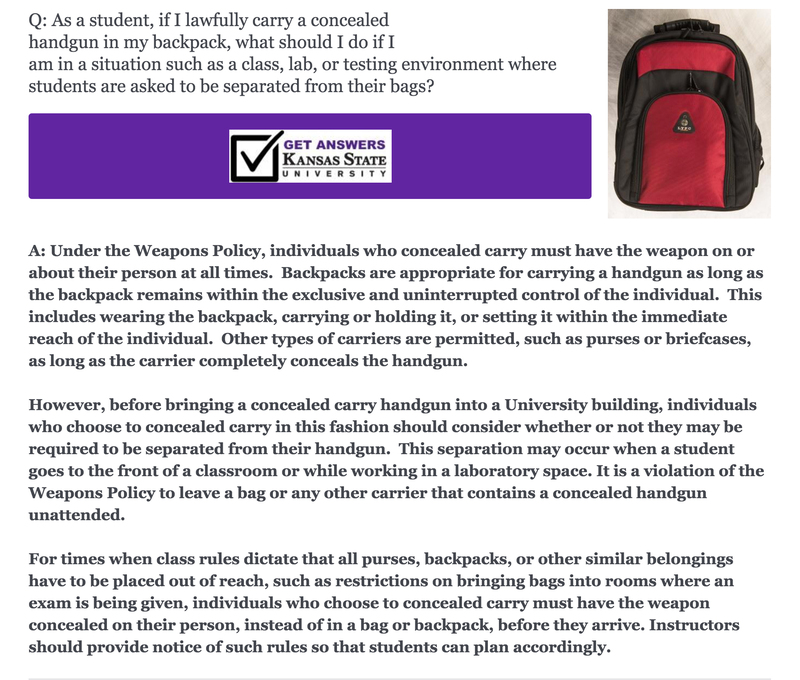 They tell us, first, that “concealed carry of handguns will be allowed” all over K-State campus and, second, that “K-State continues its commitment to the safety of students, faculty and staff.” Because, you see, these two ideas are in no way incompatible! Hahahaha. Ha. But, for more fun, let’s get to that Weapons Policy Training module, shall we? Ordinarily, I’d say “don’t repeat the same joke twice.” But I have to admit that the “dedicated to the safety and security” of everyone juxtaposed with WELCOME GUNS! is still pretty funny the second time around. Nicely played. We have no choice about having armed and untrained students (to get a weapon, Kansas law requires no training, no background check, no license). But getting a choice of the order in which to complete the training makes me feel so much better. Thank you! Right, of course. It’s much more fun to be surprised by the firearm accidentally going off or by the student using it on a classmate or the instructor. Also, this policy helps protect the sensitive feelings of those people so cowardly that only being armed at all times makes them feel safe. Poor little snowflakes. Dropping a gun into a backpack seems like such an easy way to store it. Why bother to secure the weapon? I mean, it’s not like someone could easily grab a classmate’s backpack or unzip the backpack and get the gun out. That’s highly unlikely. And since a person with no training on how to use a weapon will of course take all appropriate precautions, we can be confident that he (or she, but probably he) will leave the safety on. Also, the need to keep the backpack “within the immediate reach of the individual” creates a fun new classroom game: Is That a Gun in Your Bag or Do You Suffer from Backpack Separation Anxiety? The game works like this: Watch your students, and see who keeps the backpack very close at all times. Is that student carrying? Could be! What about that student, over there? Hmmm. And why are those two students whispering near that satchel? Points will be awarded based on the ratio of correct answers to survivors. So, then: office hours cancelled until further notice. Great! I’m learning so much from this module! Bonus: Not having office hours will save time, as will absenting myself from campus except when I absolutely have to be there. This Weapons Policy is looking better and better! Introducing my new policy: A’s for all students! You are all brilliant, wonderful people! You all get A’s! Another part of the genius of concealed carry: by making every student a potentially armed student (and thus an implicit threat), faculty can treat them accordingly. 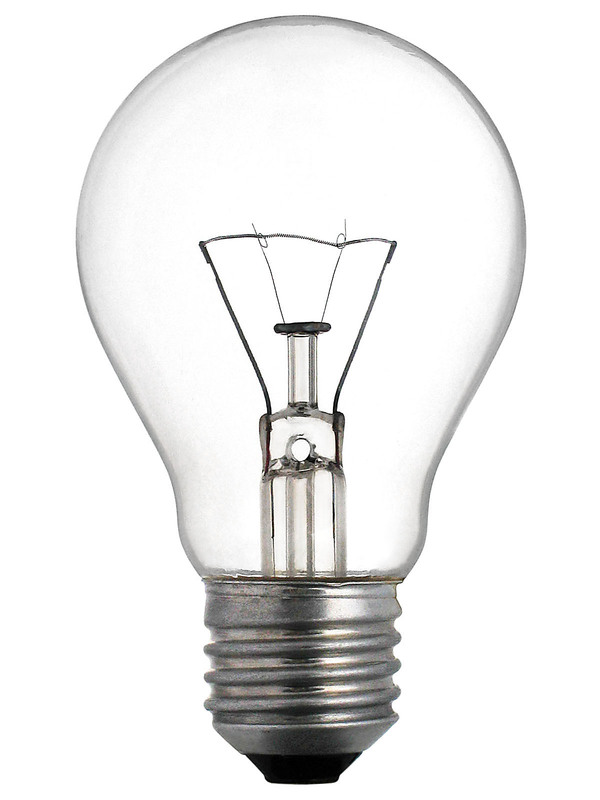 We can be spared the time of grading, by acknowledging that each and every one of our students is a certified genius! Also, since campus carry revokes the safety upon which freedom of speech depends, why bother laboring over challenging discussion questions? Fear inhibits discussion, and, well, we wouldn’t want a student to feel threatened by an intellectual challenge, now would we? Of course not. That would be rude. I mean: the very idea of challenging students to think! That’s so, I don’t know, pedagogically sound. Extra credit question: Is there any chance that weaponizing the campus will lead to such egregious grade inflation that a degree from a Kansas university will become meaningless? Let’s find out! Well, this has been a fun survey. I’d really love to take the rest of it, but no time at the moment. After all, I have an exit strategy to plan — er, I mean, work to do! I have work to do! Bye! books — the eleventh, Was the Cat in the Hat Black? will be out this July from Oxford UP. Firearms and Fascists: Does the Kansas House believe in democracy? 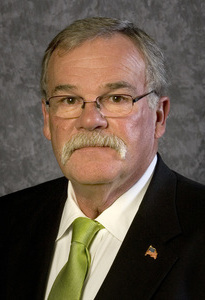 For nearly two months (since January 18th), Representative John Barker — the chair of the Kansas House’s Federal and State Affairs Committee — has refused to bring House Bill 2074 to the full Kansas House so that the entire chamber can vote on it. The bill extends universities’ and hospital’s exemption for campus carry, and it’s a popular bill: the public testimony in favor has consistently far exceeded the testimony against it. Instead, tomorrow, the committee will consider HB 2074’s nemesis, HB 2220. It prohibits any regulation of guns on college campuses, and any current regulations are rendered “null and void.” And no, I’m not joking. Read the bill. I cannot be there to testify at 9:00 AM Thursday March 9th in Room 346-S. So, I have sent my testimony in advance. It’s my third such testimony this semester. Though I wrote it in haste, I make no apologies for its content. HB 2220 is a fascist bill. And the committee’s failure to bring HB 2074 up for a vote prompts me to question Representative Barker’s commitment to the democratic process. Let the House vote! HB 2220 is not only a bad bill. It is a fascist bill. Faculty, students, and staff of Kansas Universities are overwhelmingly against campus carry. And so, has the House Committee on State and Federal Affairs advanced HB 2074 — which would continue the exemption for universities and hospitals — so that the full House may vote on it? No. Instead, it is now considering HB 2220, which forces guns onto Kansas university campuses against the will of those who study and work there. My question for the committee is this: Do you believe in democracy or don’t you? Why not let the House vote on HB 2074? Why advance this dangerous bill (HB 2220) instead? There is no evidence that weaponizing campuses makes them safer. In fact, quite the opposite is true — as many have told you before. In a state where guns are not regulated (where owners of firearms do not even need to learn how to use their weapons), inviting them onto college campuses is reckless in the extreme. You increase the risk of death by accident, and by intent — the likelihood of a successful suicide increases when firearms are accessible. And you do not prevent mass shootings. The “good guy with a gun stops a bad guy with a gun” is an alternative fact promoted by the NRA. Think about it: in an active shooter situation, an untrained but armed person will magically be transformed into a superhero? Really? (Hint: NO, guns do not turn untrained civilians into superheroes.) If the military does not allow guns in its classes (except for weapons-training classes) or in its barracks, why should colleges? The military are trained professionals. Faculty, students, and staff on college campuses are not — by design, since Kansas refuses to adopt even the modest provision that gun-owners learn how to use their guns. Though I offer these thoughts as a private citizen, my opinions are informed by my job as professor at Kansas State University. I have enjoyed my decade-and-a-half living and working in Kansas. However, now that the legislature insists on endangering my life, and the lives of my colleagues and students, I find that I enjoy it much less. Indeed, in addition to seeking another job, I find that I have to spend valuable time trying to convince my state legislature not to kill us all. So. Oppose HB 2220. Bring HB 2074 up for a full vote. Thank you for your time and for your attention to this urgent matter. Tell him and them to exempt university campuses and hospitals from firearms. Advance HB 2074 to the floor of the House for a vote. Oppose HB 2220. 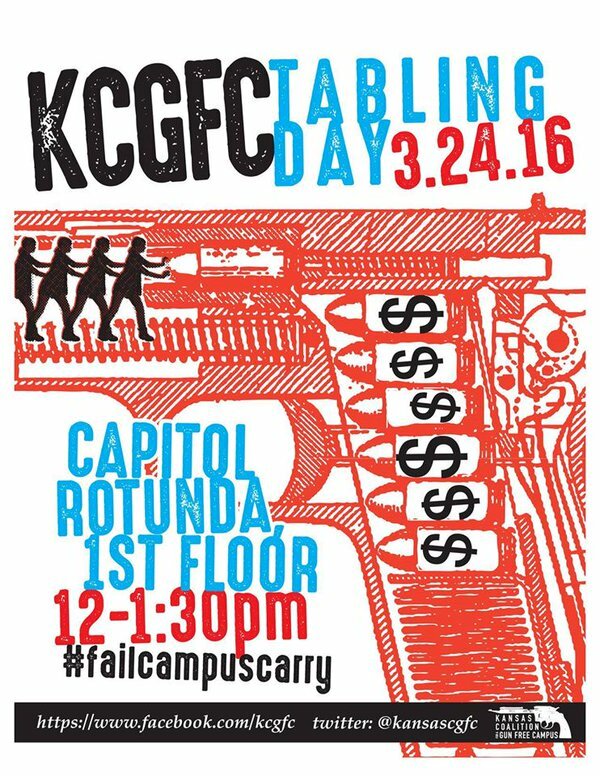 “Killing Higher Education, Literally: Kansas’ Campus Carry,” 1 Feb. 2017. My most recent testimony. I was not able to deliver this in person. There is, however, a Kansas House bill that offers a chance to bring this idea — exempting campuses from firearms — to the House for a vote. If it passes a House vote, the bill would then get sent to the Senate for a vote. Thus,… more testimony in Topeka this morning! I cannot attend today’s hearing. So, I have submitted my testimony in advance. Here it is. My name is Philip Nel. I am a University Distinguished Professor of English at Kansas State University (though, of course, I am speaking here as a private citizen). I’ve happily called Manhattan home for over 16 years, but — in response to campus carry — I’m not sure how much longer I’ll be calling it home. The legislature’s decision to force firearms into our classrooms, offices, libraries, laboratories, and student centers has me looking for another job. My specialty is Children’s Literature. There are not a lot of senior positions in my field. So, I cannot predict when my departure may be. I may be here for a while longer. I first went on the market last year and received the offer of an endowed Chair in Children’s Literature at a top university in another country. I very much wanted to accept the offer, but my wife (also an English professor) was understandably unconvinced that there would also be an opportunity there for her. So, for her sake, I reluctantly turned it down. If campus carry does arrive as planned, I could not turn down such an opportunity again. Perhaps she and I will have to live in separate states or countries until both of us find a way out of Kansas. I don’t know. I do know that guns endanger the lives of students, faculty, and staff. I know also that in college classrooms, we discuss difficult, contentious subjects. Armed students make these difficult, necessary conversations impossible to have. Concealed carry turns each student into a potentially armed student — and thus into an implied threat to fellow students. Fear inhibits discussion. Campus carry makes it impossible for me to do my job. So, I’m seeking work elsewhere. Since that may not happen immediately, I am also applying for fellowships out of state (and out of the country). I like my job, and I love my colleagues. However, if the state of Kansas wants to make it impossible for me to do my job, then I’ll need to find a way to keep doing my job somewhere else. The prospect of leaving great friends, colleagues, and students saddens me. The great people I work with are the main reason I’ve stayed here, despite the legislature’s and governor’s persistent defunding of public education. I’m more than willing to put up with Kansas’ ongoing efforts to kill higher education. But when Kansas also wants to kill me and my colleagues and my students, then I want out. So. I urge the legislature to vote yes on House Bill 2074. Thank you. I would add here that if I am unable to find employment elsewhere, my stance remains unchanged. Should students wish to take my classes, they will need to disarm. Period. I will never teach armed students. That is not negotiable. In fact, the fact that I should even have to make this argument offers some indication of how insane this state and this country have become. Drop me a line. I’d love to hear from you! And, Kansans: contact every member of the House Federal and State Affairs Committee. Tell them to exempt university campuses and hospitals from firearms. Do it. Now. Silence is complicity. “Testify! Keeping Kansas Universities Gun-Free,” 26 Jan. 2017. My statement, delivered in person to the Kansas Senate Federal and State Affairs Committee at the state house, last Thursday. As you can see from Regan Tokos’ photo (taken just before the hearing), above, the room was packed: standing room only, with many people spilling out into the hall. We supporters of SB 53 far outnumbered those who sought to invite guns into our classrooms, libraries, dormitories, lecture halls, offices, and laboratories. Last night, I learned that 53 people had submitted testimony supporting the measure, and only 5 people had supported testimony against it. The rules were: testimony must be submitted in advance in print (could not be emailed), and if you also wanted to testify in person, then you also had to phone or email Senator Jacob LaTurner‘s office to let them know you planned to testify. Citing our large numbers, Senator LaTurner (who chairs the committee granting the bill a hearing) gave supporters of the bill only 90 seconds each. He granted opponents of the bill between 2 minutes and 4 minutes 30 seconds each. (Senator LaTurner opposes the bill.) So, we all abridged our remarks on the fly. Here is my full statement. I managed to fit in points 2, 3, and 4 today at the hearing. Good morning. My name is Philip Nel. I’ve called Manhattan home for over 16 years. And I’m here to urge the legislature to vote yes on Senate Bill 53. Though teaching at Kansas State University has certainly shaped my opinion on the subject, I’m here as a private citizen only. Here are five reasons you should support SB 53. First, unlike other campus-carry states, Kansas doesn’t really regulate guns anymore — you don’t need a license or permit or even lessons on how to use a gun. Inviting unregulated firearms onto college campuses does not make students safer. It places them at greater risk. Accidents happen. Suicidal students with a gun are much more likely to succeed in killing themselves. College can be an emotionally volatile time. Adding unregulated guns is dangerous. Second, the military does not allow guns in its barracks or its classrooms — unless the class is actually on how to use those guns. So, if trained professionals prohibit guns from their classrooms and living quarters, why should we invite people to arrive on a university campus or in a hospital armed but untrained? Third, that whole “good guy with a gun stops a bad guy with a gun” notion is what we might call an “alternative fact.” In other words, a lie. Between 2000-2013, the FBI found only 1 of 160 active shooter incidents was stopped by a civilian with a concealed carry permit. Again, that’s 1 out of 160. In contrast, during that same period, 21 incidents were stopped by unarmed civilians. In fact, armed civilians are much more likely to get in the way of first responders than help them. Fourth, in a university, we are armed with reason, not weapons. University classrooms have long been a safe space for students to discuss important, contentious subjects. Campus carry would change this dynamic profoundly. In a concealed-carry classroom, every student is a potentially armed student, and thus an unspoken threat to his fellow students. In other words, campus carry revokes the safety upon which freedom of speech depends. Fifth and finally, if the legislature passes SB 53, then it will be helping universities and the KU medical center by making them places that attract talented people — rather than encouraging those people to decide that, because of campus carry, they would rather take a job in another state. So, please vote yes on SB 53. Thanks to LoudLight (who filmed this), you can see and hear all of the testimony. Senator Tom Hawk (D-Manhattan) begins, and hits all of the main points of our argument — even, I was pleased to see, a citation of the Kansas State University Distinguished Professors’ opposition to campus carry. You’ll hear activist extraordinaire (and KU grad student) Megan Jones at around 12 mins. in, K-State UDP Elizabeth Dodd at 15:45, yours truly at about 27, K-State Associate Professor Daniel A. Hoyt at 29:15, and K-State undergrad & general force-for-good Regan Tokos at around 45 mins. What now? Well, we next need Senator LaTurner to have the committee pass the bill out of the committee for debate of the full senate, giving all senators a chance to debate its merits. We also will need support from the house, and the governor. Incidentally, inspired by Megan Jones, I spoke with Governor Brownback before the hearing. (Megan spotted Governor Brownback first, and went up to talk to him. She was swiftly followed by Elizabeth Dodd. I was next.) We all asked him to support the safety of faculty, students and staff. He was polite and non-committal, appearing receptive to our concerns. However and given his previous support for the “Guns Everywhere” law, I doubt that he will in fact support SB 53. That said, I would very much like to be wrong, and so shall continue to speak up — and encourage you to do so, too! In particular, contact the members the Kansas Senate Federal and State Affairs Committee, and encourage them to bring the bill to the full senate for a vote. Thank you! Mike Hutmacher, “Professors, students urge senators to stop impending campus carry,” Wichita Eagle, 26 Jan. 2017. Jonathan Shorman, “Proponents of repealing campus carry pack tense, chaotic hearing,” Topeka Capital-Journal, 26 Jan. 2017. Alex Brase, “Kansas lawmakers debate end to campus carry law,” K-State Collegian, 27 Jan. 2017. “Guest Editorial: Putting guns on campus is unsafe, disruptive to learning.” K-State Collegian, 21 Sept. 2016. In my statement above, I recycle several of the points from this article. Brief remarks on the university in an age of misinformation, delivered today when I received a Higuchi Award. It’s a great honor to be joining Professors Christer Aakeröy, Judith Carta, and Randolph Nudo in receiving recognition for our research. It’s especially meaningful to be receiving this recognition right now, at a moment when facts and the notion of policy based on facts are being pushed aside in favor of — oh, let’s call it alt-truth. As I’m sure you know, the incoming presidential administration has nominated a climate-change-denier to head the EPA. And yet, here we are today, honoring scientists, as we should be — honoring a pioneering scholar in rehabilitation medicine, and an international leader in crystal engineering and supramolecular chemistry. Meanwhile, in decisions being made outside of our hallowed halls, the nominee to oversee our nation’s public education system wants to dismantle it, replacing it with unregulated, for-profit charter schools. And yet we’re here today honoring a national leader in early childhood special education. As we should be. This incongruity between what we’re celebrating now and what we face in the very near future makes the Higuchi Award feel even more special — a bright light in the gathering darkness. I have been feeling lately — and I would imagine that my fellow Higuchi honorees may share this feeling — that our work has become much more urgent than it was before November 9th. 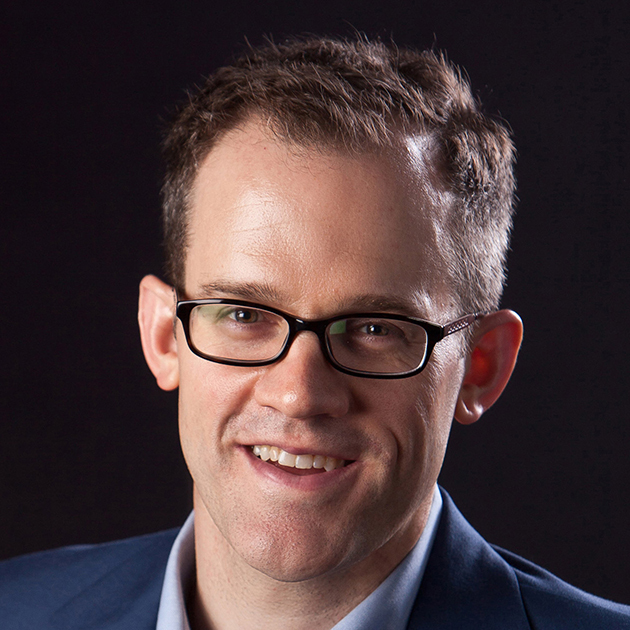 My next book — which is on racism in children’s literature — will appear a few months into an administration with a White supremacist Attorney General, a White supremacist Senior Advisor, and an Islamophobic National Security Advisor.1 As we’re entering this period of backlash, I continue to believe that diverse, inclusive children’s literature is one of the best places to imagine a better future. Stories we encounter when we are young, when we are selves in the process of being formed, have a lasting impact on the people we become. Stories tell children that they belong (or don’t belong) not only to a broader community of readers, but also in their neighborhoods, their schools, and their country. As we face a concerted federal effort to revoke civil rights, we can — and we must — nurture a new generation that is less susceptible to bigotry and the many wounds it inflicts. That’s something we can do in children’s literature, and anywhere in higher education. So. Thanks to KU and the Higuchi family for supporting these values by supporting our research. My personal thanks to Jim Guikema for assembling my nomination, to Elizabeth Dodd for her support, and to Karin Westman for her love, encouragement, and extraordinary patience over the past 23 years. And thanks to all of you, not just for coming today, but — through your roles in Kansas higher education — for continuing to work for a state, a country and a world where research matters, where facts matter, where education matters, and where all of us can receive the same inalienable rights to life, liberty, and the pursuit of happiness. Thank you. Scott Pruitt is EPA nominee; Betsy DeVos is Secretary of Education nominee; Jeff Sessions is Attorney General nominee; Steve Bannon is Senior Advisor; Gen Michael Flynn is National Security Advisor. Third paragraph draws from Greg Downey, “The presidential election of 2016 and the values of a research university.” Greg Downey 9 Nov. 2016. Ordinarily, I wouldn’t post something as (frankly) inconsequential as a thank-you-for-this-award speech. But, in these dark times, I have been finding it helpful to read others’ affirmation of our core values. We need to keep speaking out. We need to affirm our shared humanity, our belief in civic discourse, our certainty that facts matter. It is in this spirit that I’ve decided to post these remarks. In addition to increasing the risk of suicide and fatal accident, armed students make other students uncomfortable and squelch debate. A university should be a safe place where students can discuss important but uncomfortable subjects, where they can engage in vigorous exchanges of ideas. Campus carry changes this dynamic: when every student is a student with a potential gun, an unspoken threat revokes the safety that sustains freedom of speech. I would also add this: without freedom of speech, the university ceases to function as a university. So, if you’ve an interest in Kansas State University continuing to be a university,… VOTE! In the November elections, support candidates who oppose campus carry, and who are willing to either repeal or amend the so-called Personal and Family Protection Act (which would more accurately be described as the Guns! Guns! Everywhere! Act). As of July 1, 2017, the Kansas legislature is forcing all state universities to admit guns onto their campuses — classrooms, offices, laboratories, libraries, student unions, dormitories, counseling services. Everywhere. The Weapons Advisory Work Group has drafted a “University Weapons Policy,” and we have been invited to comment. 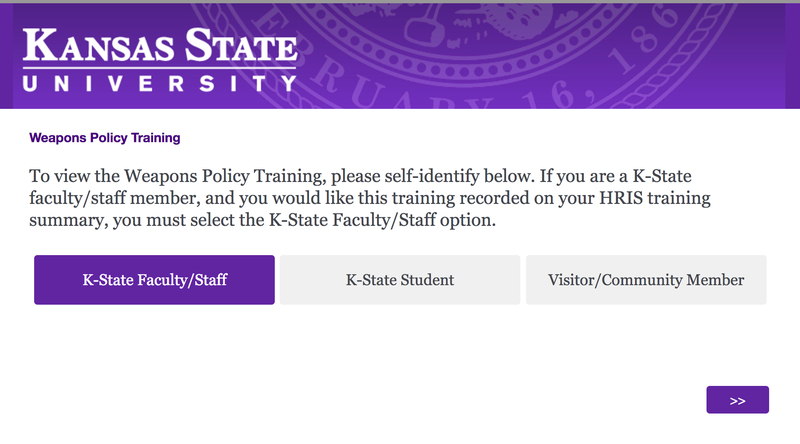 If you’re employed by or attending Kansas State University, please submit your comments. In case you need some inspiration, here is what I wrote. Thank you for the time you’ve spent crafting the University Weapons Policy — a thankless job with an unachievable goal. Thanks also for granting us the opportunity to review the draft of this policy. The key problem — as you likely realized, while drafting this — is the state’s (sarcastically named?) Personal and Family Protection Act is impossible to implement safely. For instance, the University Weapons Policy states, “There are no University locations that have been designated as prohibiting concealed carry with permanent adequate security measures” (p. 3). None? Not even the nuclear reactor? Or labs with volatile chemicals? Yes, the “adequate security measures” written into the law are prohibitively expensive to implement. Those who drafted the law deliberately defined the “adequate security measures” in precisely this way. According to the law, buildings equipped with metal detectors and armed guards are the only locations where guns may be prohibited. To secure all buildings at Kansas State University (including Vet Med and the athletics buildings) would cost $110,419,000. The state of Kansas’ annual contribution to the university’s budget is approximately $160,000,000. In other words, only by devoting 69% of the state’s contribution to “adequate security measures” could the university legally secure entrances to all buildings. That’s unlikely to happen, and the legislators who voted for this bill know that. Perhaps the expense is why you’ve marked stadiums as an exception to the state’s campus carry policy: “To the extent adequate security measures are used to prohibit concealed carry into stadiums, arenas and other large venues that require tickets for admission, the tickets shall state that concealed carry will be prohibited at that event. Signs will be posted as appropriate” (p. 6). It’s a great idea to attempt to protect people from lethal weapons at football games. But could we not extend this language to the places where the business of the university actually gets done? If we’re willing craft such an exemption for the stadiums, then why not issue “no concealed carry” tickets for labs, classrooms, libraries, and offices? I am also puzzled as to how the university will enforce this new weapons policy. In Kansas, anyone over the age of 21 can legally conceal-carry without a permit, without training, and without a background check. As a result, the policy — while well-intentioned — does little to maintain the safety of the university’s students, faculty, and staff. For example, I appreciate the University’s attempt to provide guidelines for “Carrying and Storing Handguns” (p. 4) and for “Storage” (p. 5). But how will these guidelines be enforced? The sanctions are a start: “Any individual who violates one or more provisions of this policy may be issued a lawful directive to leave campus with the weapon immediately” (6). But what would stop the individual from coming back another day? And how will we discover that the Weapons Policy’s provisions have been violated? The individual starts shooting people? A gun goes off accidentally, and kills a classmate? Also, if there is no Campus Police officer in my classroom (and there is almost never a Campus Police officer in my classroom), what actions should I take when confronting a student or faculty member who has begun shooting people? If a shooter threatens my classroom, what might I do to minimize the carnage? The problem here is that the law — and the University Weapons Policy it has inspired — still allows students to bring guns into classrooms, dormitories, dining facilities, counseling services, and faculty offices. It’s great to stipulate (as the university policy does) that students & faculty cannot store guns in classrooms and faculty offices, but… guns can still be brought into classrooms and faculty offices. So, if a student has a grade dispute, am I allowed to ask if he’s armed before making an appointment to meet him in my office? Or would it be safer to just give him whatever grade he asks for? For that matter, if all of us can carry weapons, under what conditions are we allowed to fire them? If a student is acting in a way that makes an armed faculty member feel the need to defend himself or herself, when would the faculty member be justified in opening fire? The weapons policy says that when “necessary for self-defense,” one can “openly display any lawfully possessed concealed carry handgun while on campus” (p. 3). OK, but what’s the criteria for “necessary” here? If we are armed (and, for the record, I do not plan to arm myself), when would it be acceptable to shoot? Similarly, under what conditions would the shooting of a faculty member or staff member would be justified? If we’re allowing guns on campus, then guns will be used on campus. We need to establish clear criteria for their use: “necessary for self-defense” is dangerously vague. What provisions will the university be implementing for those who are particularly at risk? For instance, a student goes to Counseling Services: she’s feeling traumatized, after being raped by a weapons enthusiast who is also a fellow student. What will the university do to ensure that she feels safe in Counseling Services, in her dorm, or in her classes? What provisions does the University Weapons Policy have for her? I would also be interested to learn how the university plans to protect those classes in which students have necessarily uncomfortable discussions about subjects that elicit strong responses: racism, genocide, sexism, transphobia. How will the University Weapons Policy ensure that classrooms are a safe space to explore difficult subjects? How will the policy address the fact that, when any classmate can potentially be carrying a weapon, we — students, teachers — are less likely to talk about challenging subjects? A university is supposed to encourage the free and open exchange of ideas, but concealed carry makes this exchange less free and less open. Where does the policy addresses this problem? 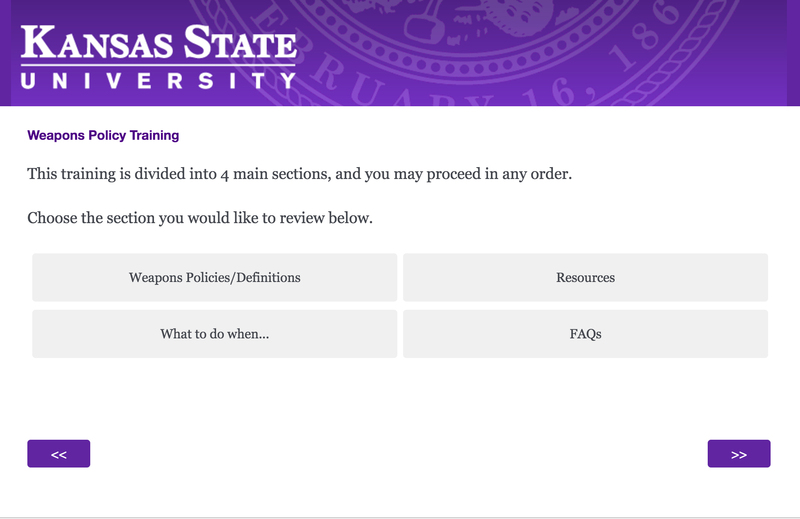 Indeed, why does the University Weapons Policy not mandate a warning on the university’s website? People (students, faculty, staff) who are both armed and untrained pose a threat to the safety of those who study and work at the university. All should be warned that entering Kansas State University’s campus after July 1, 2017 is dangerous. The university posts advisories for other hazards — thunderstorms, tornados, and the recent “boil advisory,” when a power failure compromised the town’s water supply. Why not an advisory for the increased risk of gun violence? Weapons Policy Amendments, including Draft university weapons policy. Kansas State University Distinguished Professors, statement on weapons policy, K-State Today, 2 Dec. 2015. Editors, “Editorial: Campus carry law needs to be repealed,” Topeka Capitol-Journal, 1 Sept. 2016. Fermin Debrabander, “How Guns Could Censor College Classrooms,” The Atlantic, 4 Mar. 2016. Gun-Free UT, “The Arguments Used by Campus Carry Supporters Are Wrong.” Gun-Free UT, 15 Nov. 2015. Gun-Free UT (excellent site; incredible resources). Start with this debunking of arguments used by campus-carry advocates. Stop Campus Carry. Includes a page of resources. Today, I’m joining other members of K-SAFE (K-Staters Against Fatal Encounters) and the KCGFC (Kansas Coalition for a Gun-Free Campus) at the statehouse, in Topeka. There, we’ll hand out flyers that — we hope — will show our legislators the grave danger the “Kansas Personal and Family Protection Act.” Yes, this is really the name of the act that invites guns into dormitories, classrooms, counseling services, lecture halls, football stadiums, and faculty offices — and that will go into effect on July 1, 2017. Here is a pdf of the flyer I’ve brought. Below, the text of the flyer. According to legislation passed by the Kansas Legislature in 2013, state and municipal bodies cannot ban any legal gun owner from carrying concealed handguns on their campuses and public spaces, beginning in July 2017. The 2015 Kansas Legislature amended the law to drop any requirements for firearm or permit training for carrying concealed weapons. These moves are currently supported by the Kansas Board of Regents, who are legally charged with the safety of all Regents institutions. 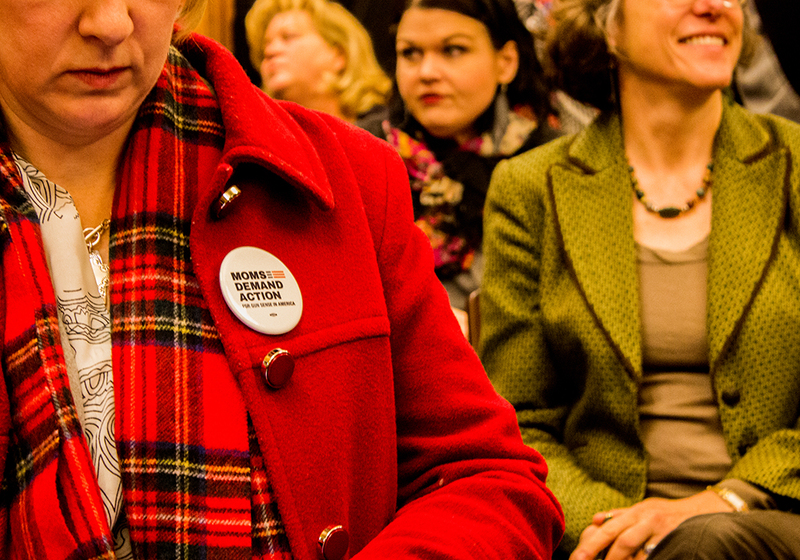 70 percent of state university employees in Kansas oppose campus carry. Elizabeth Dodd, “Argument is War: Are You Down With That? The Threat of Campus Carry in Kansas,” Manhattan Alliance for Peace and Justice Newsletter Spring 2016. Note: To read the article, scroll down to page 3. The National Rifle Association is working to force guns into lecture halls, libraries, offices, dormitories, and stadiums. Their efforts to weaponize college campuses are succeeding. At the time of the Virginia Tech massacre (32 people killed, 2007), only one state university system (Utah) required colleges and universities to allow guns on campus. Following the mass slaughter at Virginia Tech and Northern Illinois University (5 people killed, 2008), you might think that the NRA would have begun backing sensible gun regulation. Instead, the NRA proposed a bill requiring colleges and universities to have guns on campus. Thanks to the NRA’s support and ALEC’s advocacy, there are now 8 states that have adopted a version of this bill, allowing guns on campus: 2 of those for concealed-carry permit holders (Colorado, Utah), and 6 guns in some circumstances (Idaho, Minn., Mississippi, Oregon, Texas, Wisconsin). As of July 1, 2017, Kansas will join these states. There is no evidence that increased gun presence has decreased death or injury by guns on campuses. Whether on campuses or elsewhere, private citizens have had no appreciable success in preventing deaths by intentional shooters, accidental shooters, or suicidal individuals. Beyond the boundaries of universities, the evidence is that the presence of guns in homes increases the likelihood of death or injury by gunshot. We believe our community is safest without guns in our midst, except in the hands of on-duty law enforcement officials. We are dedicated teachers, mentors, researchers, and colleagues. 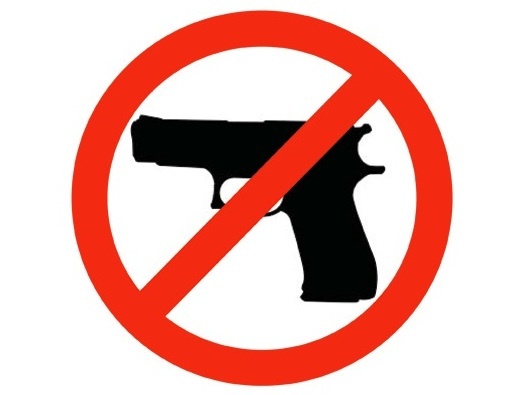 We believe that the unrestricted presence of guns in our classrooms, offices, lecture halls and other spaces will make us and our students feel less safe. It will compromise the open door policy many of us maintain, in which students and others are free to drop by our offices to consult or converse. It will make students less open to working together with others whom they may not know well, and will adversely affect their educational experience. We believe that by compromising the safety of our community members, sanctioning guns on campus goes against the mission of the university. We are not the only educators opposing state legislatures’ attempts to endanger the lives of students, faculty, and staff. I’ve been encouraged to see other organizations and individuals speaking out against the false notion — promoted by the NRA and their legislators — that making it possible for more people to kill other people somehow magically increases the safety of all people. As of the middle of October 2015, there had been 25 shootings on American college campuses this year, resulting in 23 dead and 25 injured. These include mass shootings, accidental shootings, and murder-suicides. (Suicide is a leading cause of death for college-aged people and guns are used in the majority of these deaths.) I haven’t checked the statistics as of today (December 2nd), but I know there have been others since mid-October and fully expect there to be more before the end of the year. Here’s hoping that I’m wrong.